Yes, I think they do, for the most part. I think everyone, at one time or another, has said they’d do something that just didn’t pan out for some reason, but I always give it my best shot. 2. Sick as a dog, go to the dogs, dog days of summer, dog tired, it’s a dog’s life, every dog has it’s day, can’t teach an old dog new tricks…now doggone it which saying could most recently be applied to your life? I’m going to say “dog days of summer”! It’s dreadfully hot and humid here, plus there’s an over-abundance of mosquitoes and gnats making it nearly impossible to spend any time outside. It’s miserable, and the ground is so wet my shepherd’s hooks keep falling over, leaving my hanging baskets on the ground! Marley & Me. Actually, I’m cheating a bit, because I own the book, but haven’t actually read it, yet. However, I’ve seen the movie twice, and loved it–except for the ending. It’s a classic tale of a young married couple who adopt a puppy to be their “first child”. 4. What’s something you hope to one day have the confidence to do? Maybe I’ll fly in a helicopter or an airplane, who knows? There’s always parasailing, too, but I’ll still die a happy woman if I never do any of these things. Passing the optimist’s room, the father found him dancing for joy around the pile of manure. “Why are you so happy?” he asked. Last week, I forgot to post about our little grandson’s recent mishap. Chase fell off the end of a basketball arcade game, and broke his left arm–on the Friday of weekend church camp. He broke both of the bones in the lower arm. Thankfully, Chase has had very little pain with his broken arm. He even managed to attend camp for a few hours, on Saturday, and, thanks to some plastic bags, was even able to get into the pool a little bit. The following Tuesday, Chase was also able to get a neon cast, in the colors of his favorite wrestler, The Ultimate Warrior! Just look at that smile! Chase even managed to get his awesome cast autographed by one of our area newsmen, Dal Cannady, last Friday, while taking a tour of “The Storm Chaser” (weather lab on wheels). All’s well that ends well, right? Five more weeks and Chase’s arm should be as good as new! I kept our grandson, Chase, while his parents did some Easter shopping, on Friday. 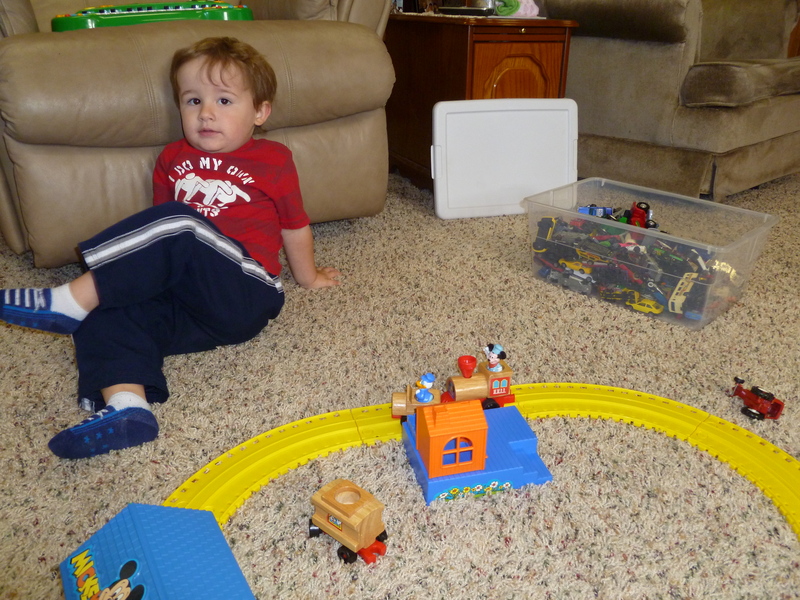 Chase and I enjoyed each other’s company while watching three episodes of ‘Mickey Mouse Clubhouse, and playing with the Mickey Mouse Railroad set. 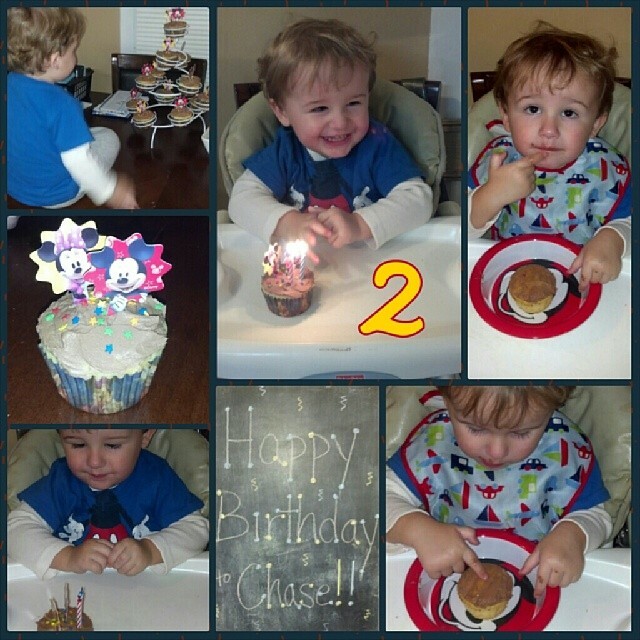 Things went well until nap time, then Chase’s stubborn streak came out! Let’s just say…Chase didn’t take a nap–not at my house, anyway! He sat in the middle of the bed and watched me attempt to rest 🙂 The little stinker! For the first time, in several weeks, our house was noisy, crowded, and very ‘alive’ on Friday night! Once again, our entire family was able to gather together, and it was great to see everyone, all in one place, again. Ed was the cook, this time, serving up a delicious ‘Low Country Boil’, something we don’t have very often! I think it’s safe to say, we all enjoyed it! Good times and good memories were in the making. The rest of the weekend remained relatively busy. Brad and his family left, on Saturday, to visit Jennifer’s family, and Ed and I piddled around the house, working on various projects–or should I say, Ed worked while I watched. By the end of the weekend, all of our grass had been mowed, including Ed’s mom’s yard, ‘the girls’, aka our hens, had a new extension on the roof of their home, and the water line at Ed’s mom’s had been repaired. Ed went to bed tired! Okay, now that the weekend has come and gone, Monday means it’s time to kick-start the week with a little ‘Monday Quiz’. I’ll be joining Heather and Wayne over at ActingBalanced. If you wish, you can play along, too, by clicking their button below! 1. Wednesday is “Make Up Your Own Holiday day” – what will it be for you? I may be celebrating with a ‘Spring Cleaning’ holiday. I’ve been feeling the need to do some of that! 2. Is your March full of madness? Yes, the month of March was filled with some ‘madness’ for us! First, Ed’s work salary was cut by 5%, then our grand baby, Evan, got sick, and stayed sick for two whole weeks, culminating with a visit to the hospital! Hopefully, April will be kinder. 3. Yesterday was National Chip and Dip day – are you a fan? What is your favorite dip, favorite chip? I’ll eat chips and dip, but it’s not high on my list of ‘must haves’. Hamburger dip with tortilla chips is pretty good though! 4. Is it a good idea to write about discord in your workplace on your blog? 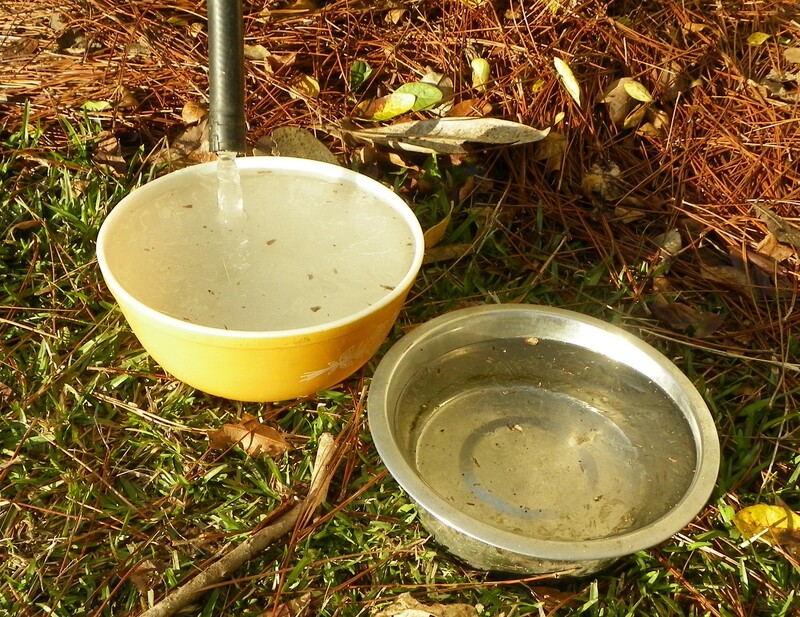 It’s hard to tell, but those are the water bowls, for our outside pets, and they’re frozen! I guess Ed left some water dripping from the hose, and the water froze in mid-stream! Cool! I feel a bit guilty, complaining about the cold, when I know my friends up north are having blizzards and such, but snow and ice are pretty foreign to us, here in the south. (I’d never make it in Minnesota!) 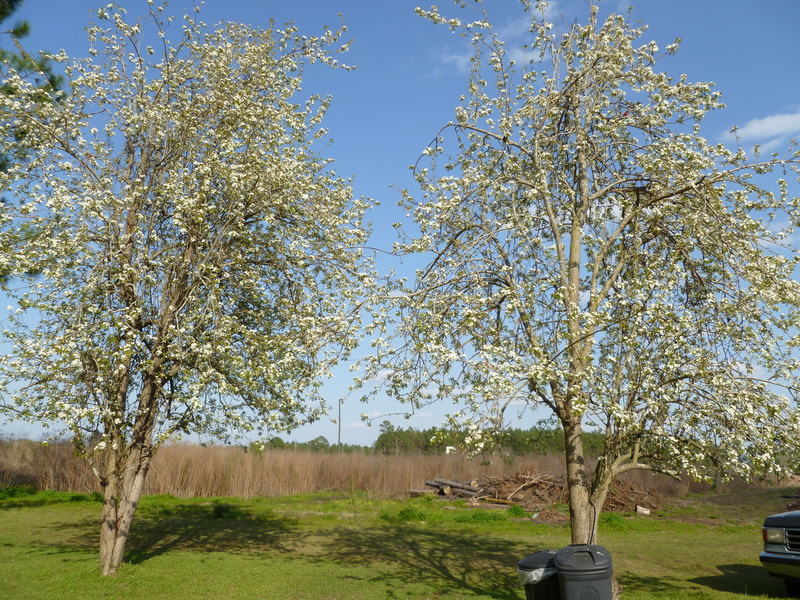 It’s nice to see the sun shinning again, after two solid days of rain, rain, and more rain! We have no big plans for the weekend, other than continuing to pack up decorations. I received an email from Brad’s wife, Jennifer, last evening, saying they are planning to stop by for a visit, on their way to her nephew’s birthday party, on Saturday. She sent some photographs of baby Evan, too, and I couldn’t believe how much he’s changed since Christmas! 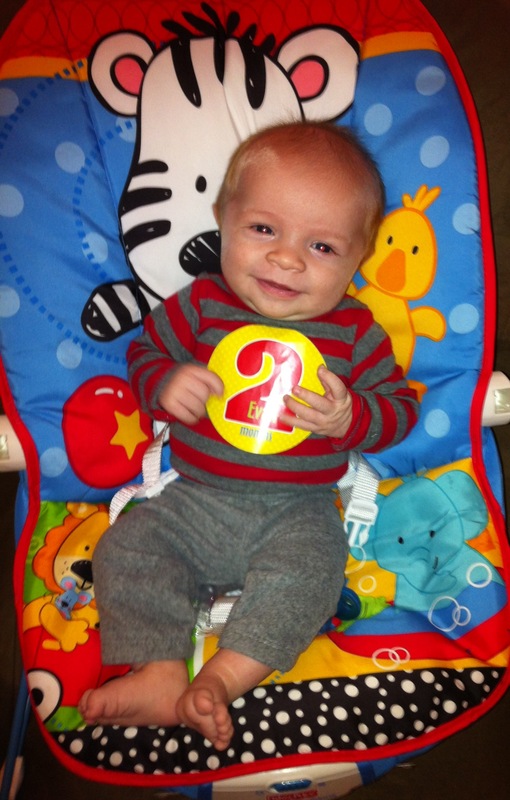 (He turned two months old, on December 30.) It looks like Evan’s hair is going to end up being blonde! Hopefully, I’ll see our other two grandsons this weekend, too. They’ve had sickness in their household, this week, so I haven’t seen them in a while either! I’m really enjoying sitting here, enjoying the warmth and glow of the fake fire in the media console, but I really need to get up and get moving. Like I just said, “Time is passing quickly.” I hope everyone has a warm and wonderful weekend. Bundle up! See you on Monday. Okay, I’m beginning to get my blogging mojo back a little bit–finally! I finally have a few blog ideas floating around in my head. However, today I am having out-of-town company and I don’t have time to write an in-depth post. Instead I’ll share a few random thoughts, then I’m heading to the grocery store for food! My brother and his wife are coming in today from Florida for a visit, although it looks like it may be a short visit due to some unforeseen circumstances. It seems to get more and more difficult for us to get together as time goes on. Either one or the other of us usually has something going on with one of us– or with our families. I’d sort of hoped that we might be able to arrange a beach get-away for all of us on this visit, but it just didn’t work out. I’ve never stayed on the beach in January, but I was more than willing to give it a try! I don’t suppose it matters where we get together, the most important thing is that we are getting together. Our daughter-in-law, Christina, went to the doctor yesterday (after running high fever the night before), and was diagnosed with “mastitis”. Ouch! That can be painful. She says she’s uncomfortable, but not unbearable. I told her she’s just tough! She’s now taking antibiotics, and continuing to breast feed baby Chase, which should take care of the problem. She goes back to the doctor for a re-check on Friday. Hopefully, after a few doses of antibiotics, she will be as good as new, and there won’t be anymore problems. Thank you for all of the prayers sent up on her behalf. I was really worried about her. Baby Chase also had his two-week checkup yesterday, and is doing great. He weighs about 8 pounds already! Speaking of babies, little Alex is doing good so far. (He’s the special needs baby that my daughter began keeping last week.) He and Brandy seem to have found their stride already. Some days he eats better than others, but he seems to be settling in just fine–and he really loves Brandy’s daughter, Madison! He looks at her and just beams. Alex also pulled up for the first time (at Brandy’s house) on Wednesday! He’s so tiny to be on his feet! He still wears a size 3-6 months clothing, and a size 1 diaper! I have a feeling that will soon change if Brandy has her way! On Tuesday I decided to spend the day doing something “fun”. I ignored the housework and spent most of the day making ornaments for my year round tree! I really enjoyed myself. I used to love doing arts and crafts, but haven’t done much of that type of thing in quite a while. I’ve had those ornament kits for over two years–just sitting there! At the end of the day, I had several new little snowmen, snowflakes, and penguins on my tree–and a great feeling of satisfaction! It was a day well spent. I need to do that more often! In a few days I’m looking forward to going to visit an old friend for the day. She lives about an hour away. Diane and I have remained friends since high school (way back in 1970), even though we have lived in different cities for nearly 35 years. We dated, then married, best friends many years ago. At one point in time, we were all next door neighbors, for several years. Now that she’s retired, too, she and I get together three or four times a year, to just have lunch and talk–and we always have a lot to talk about. Sometimes we talk about “the good old days”, or the “down side” of growing older…and we always talk about our grandchildren! Did all of you enjoy yesterday’s “Hodgepodge” as much as I did? I especially enjoyed reading everyone’s response to the “random acts of kindness” question! It made me feel “warm and fuzzy” reading those. Joyce, if you happen to read this, thank you again, for hosting this fun weekly meme. I look forward to it each week, and have met so many nice people through it! Well, my clock is telling me it’s time to go, so I’d better listen to it. I will catch up with all of you later this weekend. In the meantime, I’ll be catching up with family! Have I mentioned a time or two that I really dislike this time of the year? January is such a let down after the excitement and flurry of activity surrounding Christmas. The house suddenly looks plain and gloomy without all of the twinkling lights of the trees, or the pretty red and green decorations scattered about. Plus, deliver me from having to go into stores in January! Most look like a war zone, and looking at all the left-over Christmas items that nobody will buy just makes me sad. It always takes me until almost February to feel happy again–a box of chocolates and flowers tend to help! Speaking of January, it’s finally begun to feel like winter here! We’ve had three nights of below freezing temperatures, signaling the true arrival of the season. Of course, it’s supposed to warm back up well into the sixties by the weekend! There’s not much opportunity to wear sweaters around here anymore. In fact, I’ve discarded most of my long-sleeved apparel over the years. It makes me hot to wear anything more than a three-quarter length sleeve! 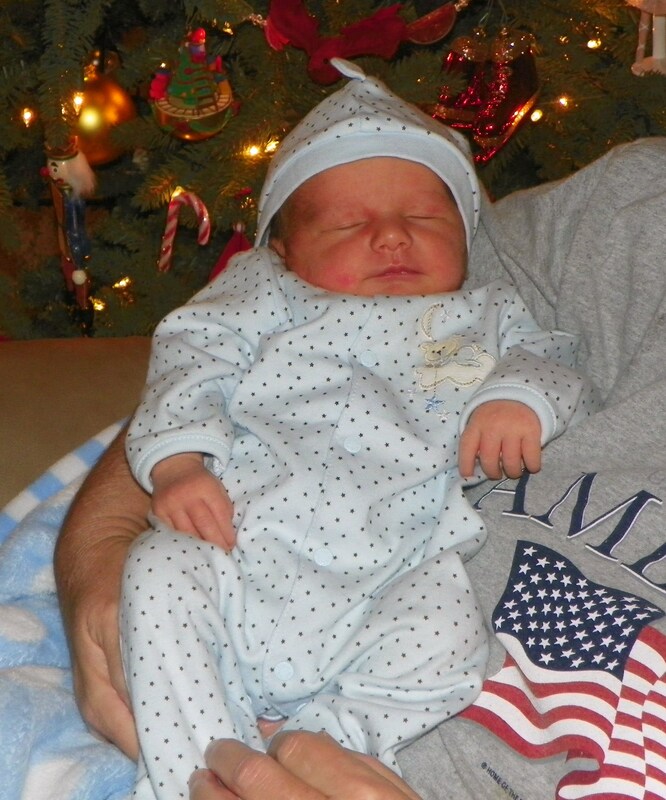 In family news, our new grandson, Chase, turned a week old on Tuesday. He’s such a cutie. I could just sit around and hold him all day! In fact, I did sit around and hold him for about two hours last night–and I enjoyed every minute of it! Daughter-in-law, Christina, came down to sit with us while Brett took their older son, Cade, to church for AWANA. I didn’t even mind when Chase filled his diaper with poop while I was holding him. I quickly discovered that I still remember how to change a diaper, even though it’s been a while. It’s like riding a bicycle–you never forget! I’ve never been more proud of our oldest son, Brett, than I am at this moment. Brett’s been on vacation since before Christmas, and he’s made extra sure that his oldest son, Cade, has gotten more than plenty of attention and love, while his wife, Christina, is recovering from her c-section and taking care of baby Chase. The family of three, seems to have transitioned into a family of four quite smoothly, and I’m so glad! After two days, daughter, Brandy, is coming along well with her new babysitting job. She proudly proclaims that she got little Alex to drink an entire bottle yesterday afternoon! I walked over to visit them yesterday morning, and it was already evident that the two were forming a bond, after just one day. It was also evident that little Alex really likes our five-year-old granddaughter, Madison. He lights up whenever she enters the room, and immediately tries to scoot over to where she is!